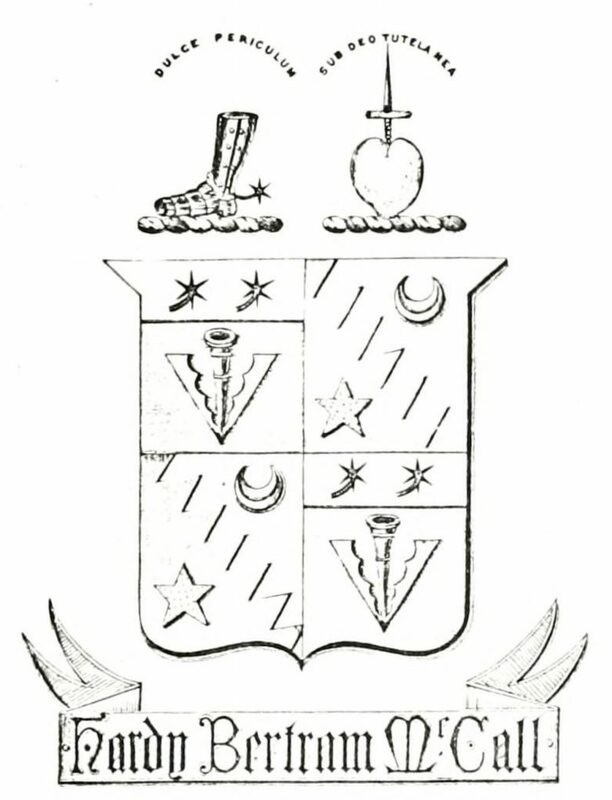 Like the Alston coat of arms these arms show the crescent and star quartered with those of the McCall family. The earliest record of someone carrying the surname De Liston occurs in Scotland when Roger De Liston witnesses a grant by the Bishop of St Andrews in the 1160’s. Ref Paradox of Medieval Scotland Roger De Liston …..
Then we have a William Chaplain of Liston as a witness to a settlement between the church of Linlithgow and the chapel of Torphichen in Scotland , this is the first link between the Liston name and the brothers of the Hospitallers of Jerusalem or Knights of St John as they were to be known as later. Ref Paradox of Medieval Scotland William Chaplain of Liston …..
Eilif of Elliston is mentioned as the father of John who is father of Avicia between 1220 and 1240. Elliston is a small parish near Melrose where the Cistercean Abbey was founded in the time of King David of Scotland. It is the only parish in the vicinity that was not held by the abbey. Many of the early Scottish Kings were buried at Melrose. Eilif is an interesting name as it is mentioned in connection with the hereditary priests of St Cuthbert who guarded his bones and the small bible associated with St Cuthbert. In Kirkliston where many of the later Scottish Listons are mentioned the church in which they are baptised is dedicated to St Cuthbert. In this early period the Liston family seem to have given the name Liston to quite a few areas in the border regions. I say this because we know Liston was already established in Essex in the 900’s as Æthelflæd of Damerham the Queen of England ( married to King Edmund of Wessex 944 ) had mentioned Liston her will. King David was the son of Saint Margaret of Wessex who herself was descended from King Edmund of Wessex, husband of AEthelflaed. Margaret had spent much of her life in Exile in Hungary with her brother who had a claim to the throne of England. The Liston place name seems to have gone from South to North when Godfrey the Chamberlain married Avicia De Liston. Alliston and Elliston are both mentioned at this time, one in Essex / Suffolk and one in Scotland. Ref: Paradox of Medieval Scotland …. Ref: St Cuthbert and the Normans …. Ref: Margaret of Wessex …. In 1173 William Chaplain of Liston witnesses an agreement between the church of Linlithgow and the chapel of Torphichen. The priest at Torphichen shall answer to the bishop of St Andrews for the cure of souls and Christian oaths and shall be chosen and represented by the brothers of the hospital of Jerusalem to the masters of the same villa. During this period Robert of Liston was the chaplain of Bishop William Malveisin who was Bishop of Glasgow 1199 to 1202 and then Bishop of St Andrews 1202 to 1238. He may have been nephew of Samson de Malveisin, ArchBishop of Rheims, 1140 to 1161. William Malveisin is credited with the writing of the Autherian legend Roman De Fergus. The interesting connection here is that Thomas De Liston is clerk to Sir William De Valence, Earl of Pembroke son in law of William Marshall and half brother of Henry III and hence Margaret who married Alexander III. ( see the Essex Listons page ). David born 1272 but died 1281 at the age of 9. The death of prince Alexander in 1284 caused a succession crisis and his father King Alexander III died in 1286 two years later. in November 1292, Edward and his 104 assessors gave the whole kingdom to John Balliol or Baliol as the claimant closest to the royal line; Balliol duly swore loyalty to Edward and was crowned at Scone. In 1294 John Balliol lost control of the Scottish Parliament who turned to France for support against Edward. Edward sent troops into Berwick and John Balliol withdrew his homage to Edward I starting 300 years of war between the nations. In 1296 Simon De Lyston is ordered to perform Fealty to Edward I, King of England along with the other Scottish Magnates. Also in 1296 the records on the Essex page show that John De Liston was ordered to the defence of the sea coast in Essex but he went sick which was a common way avoiding conflicts of interest in those times. In 1297 Edward I faced a crisis in his battles with France, he turned on Scotland where William Wallace was fighting was the cause for John Balliol. Edward I camped at Kirk Liston headquarters of the Knights Templar. Bad weather delayed the attack on Wallace and Edward I sent wine to keep up the moral of his troops which consisted of English and Welsh Factions. A fight broke out between the two and the Welsh killed 18 Englishmen. The English retaliated and killed many Welsh. Edward I was going to bring teh men back to Edinburgh but news reached him that Wallace was going to attack him during his retreat. Instead Edward I attacked Wallace at Falkirk where Wallace was defeated. Kirkliston was the headquarters of the Knights Templar who were dissolved in 1312 on the orders of Pope Clement V after pressure from King Philip IV. It is at this period that we get another reference to a Liston in Scotland when Robert Chaplain of Liston is a witness at the trial of the Scottish Templars. immunes a criminibus per suos majores in curia confessis; et hoe propter identitatem statutorum et observantiarum suarum, et mutuam visitationem. Item dixit quod nunquam audivit pro certo, nee vidit ubi aliquis frater Templi fuisset sepultus,vel quod naturali morte mortuus sit. Item dixit, quod quantumeunque possunt, semper fuerunt contra ecclesiam, et super hoc laborat publica vox fama. not immune from the crimes committed by their elders are in the court, had confessed their sins; and judge that the observances of their father, and because of the identity of the statutes, and to the visitation. She said she had never heard for sure, no one saw the brother of the Temple had been buried or had died a natural death. She said that quantumeunque may have always existed in the assembly, and public voice in this report. There also seems to have been a second migration from Essex in the form of the Alston surname when Hugh De Alston accompanied Lord Hamilton after he killed Lord Spencer in England in the 1300’s to fight with Robert De Bruce. Charles Alston’s manuscript is in Edinburgh University Library (Ms Cat. La III 375). to be made. Poterton’. [SC 1/30/1]. name of William de Cumbe, for 2 years [Gough, 50]. Memoirs of my ancestors; a collection of genealogical memoranda respecting several old Scottish families by Hardy McCall 1884 lists the genealogy of the Scottish Liston family from about the 1500s with references to earlier records.